I read a very scary book yesterday: Mark Z. Danielewski’s House of Leaves. As I explained in the first linked post, I was extremely affected by this book, on a level that no other book has ever affected me. Needless to say, it also terrified the living daylights out of me. As I was up at obscenely late (or early, depending on your point of view) hours, not able to sleep, I started contemplating ways to help me deal with my fear. As is common with me, I turned to the tarot, which I find usually calms me down when I am stressed about something. What makes fear so scary is, in part our inability to effectively deal with the unknown. By making our fear known, it helps to lessen it. We cannot deal with that which we do not know. Once we know it, it can be treated and dealt with. As such, this spread is designed to help you think about your fear, and hopefully try to move past it. The spread below has a unique shape, which those of you familiar with H. P. Lovecraft’s Cthulhu Mythos might recognize. It is the shape of the original Lovecraft Elder Sign (not August Derleth’s rehashed Elder Sign). The Elder Sign was designed by Lovecraft in his short story/novelette “The Shadow Over Innsmouth” to protect its bearers from the Deep Ones. Lovecraft also used it in another instances – such as in “The Dream-Quest of Unknown Kadath” – as a means to ward off any form of unnatural being. It has since come to be used as a ward or protective force to be employed against any manner of unnatural or eldritch beings. Since H. P. Lovecraft’s horror is known for portraying the horror of cosmicism – the utter meaninglessness of life in an uncaring, monstrous universe and the vast, unknowable depths of human consciousness and experience from which the eldritch and alien emerge – I felt that it was appropriate that the spread should take the form of his Elder Sign, to ward off the terrible unknown that forms the basis of most fear. The spread is divided into three parts: Positions 1, 2, and 3 (the stem) represent the nature of the Fear you are facing, and help to mitigate its impact by understanding what it is. Positions 4 and 5 represent the nature of your possible reactions to the fear, helping get you in the proper mindset to rationalize the Fear and your ultimate course of action with regards to it. Positions 6, 7, and 8 represent the nature of the Courage you need to summon up in order to face your Fear, and as such lie above the Fear and represent what you should ultimately do to allow the Fear to move past you. When using this spread, as always, deck choice can be key. Colorful, cheerful decks (like the Gummy Bear Tarot, Angel Tarot, Wildwood Tarot) can help bring peace of mind to you if overcoming your fear through action is what you desire. Darker decks (like the Necronomicon and Dark Grimoire decks) can often help overcome your fear through a cathartic-release effect, and might also help you more deeply consider the Fear by giving it more weight. I personally find the latter approach more beneficial, but it’s entirely up to you as the reader (or the querent as the querent). If this position is inhabited by a Sword, a Prince, or an Ace, then your fear may be buried deeply in your mind, and is a very abstract Fear, as cards with these qualities reinforce this position’s meaning and ask you to focus your attention and thoughts here. This position is meant to illustrate the way in which the above underlying cause of Fear appears to you. If your fear is, say, that you will die alone and unloved (the first position), then this position might tell you that this fear makes itself known to you through your recent string of romantic rejections. Another way to view this position is as asking the question “What prompted this Fear to awaken inside you?” This position will hopefully help explain to you how the Fear makes itself known in your life, how it shapes itself, and how it manifests in such a way as to affect you. This position represents the avatar of your Fear, its earthly representative as it descends from the realm of the abstract. If a Disk, Ten, or Princess appears in this position, your Fear may be grounded inherently in the practical; cards with these qualities reinforce the card in this position, and tell you to focus your attention here. Additionally, if this card is a two or a three, pay special attention here, as this card can represent the potential for the Fear to grow (related to the “Three” position), and also as the first “harmony” of the Fear (the “Two”). Also pay attention to Fours here, as this position also represents the manifestation of Fear. This is a relatively simple position; it directly helps you understand how the Fear has impacted your life, and what effects it is having on you. Carrying on with our example from above, if the way that the Fear of dying alone and unloved is manifesting itself in your life is that you have been rejected many times recently, the effect that this fear is having on you could be withdrawal and contemplation of your dismal prospects, perhaps thus producing a self-fulfilling prophecy. Perhaps the effect that the fear has had on you is that you are becoming more and more desperate to find someone who won’t reject you. Perhaps you are losing sleep over, or feel that your life is out of balance. Think deeply about the card in this position, as it is a reflection of your mental state as you instinctively try and cope with the Fear that you face. This position’s meaning is very broad, and can be interpreted in many ways, depending on the situation. If this card is a Cup, Queen, or Three, pay extra special attention to the card in this position, as cards with these qualities reinforce this positions meaning in terms of how the Fear is affecting you and your healthy inner life. No card in any spread is guaranteed to fit perfectly, or even well, and so the card in this position represents not “the reaction/mechanism of coping with the Fear that will help you” or “the positive way to react to the Fear,” but rather offers a (usually short-term, but also possibly long-term) course of action that might possibly help you cope with the Fear. 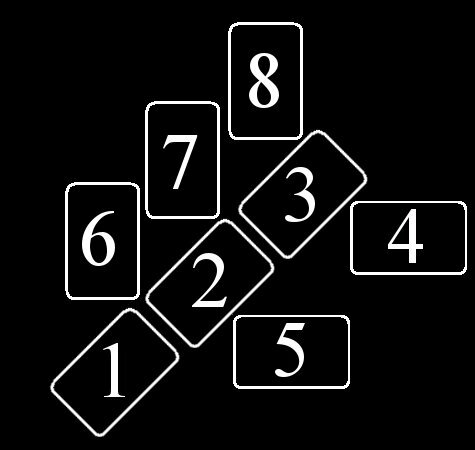 This card also serves as a sort of “sum” of the meanings of Cards 6, 7, and 8, representing them in their totality. This position asks you to think about a particular course of action and what benefits it might bring you; it is advice, nothing more, and represents one possibly way to react to your fear. Of course, thinking about the negatives of this reaction is always a positive too, and should definitely be done, though this card’s emphasis is on how to react positively to the Fear, and gives guidance primarily in that regard. Essentially, this position asks you to think how the meanings of its occupying card might help you deal with the fear well. Going along with our example, perhaps this card advises you to take a step back and take some time to contemplate your actions as seen in Position 3; maybe there is something you are doing that you can change so that you won’t be rejected. Maybe it advises you not to worry because there is someone for everyone, and with patience they will come. If a Four is occupying this position, then pay extra attention to this position, as Fours (representing Chesed and Stability) reinforce this position’s inherent desire to stabilize you among your fear. Like the above, this card has a disclaimer attached to it. The same one as the card above, in fact. Additionally, like the above position, this position is associated with Position 3 in the spread. The difference between Position 3 and Positions 4 and 5 is that Position 3 is meant to get you to think about how the fear has affected your life directly, while Positions 4 and 5 ask you to think about possible courses of actions to more effectively deal with this fear (if you didn’t want/need advice on how to help you overcome your Fear, then you shouldn’t have been doing this spread in the first place). Position 3 is a more immediate reaction, whereas 4 and 5 are more thought-out and considered reactions. That being said, Position 5 is the opposite of Position 4. Where Position 4 asks you to examine a reaction to your fear that might help you, this position asks you to examine a reaction that you should avoid, as it may harm you or even increase the power that the Fear you are experiencing holds over you. Keeping with our example, this position might tell the querent that their Fear will only be made worse if he continues going out to singles bars, or perhaps that solitude isn’t the answer for now. This position asks you to consider a possible course of action and the negative outcomes it might bring (though, again, always think about the positives too!). If a Five is present in this position, ponder it carefully, as Fives (Geburah and Destabilizing Motion) represent the energies present in this position. The three cards making up the final part of the Elder Sign mirror the three cards making up the stem. Position 6 asks you to examine the source of your Courage; where will you or should you draw the energy from to face your Fear? Will it be drawn from within you, or from without? Will it come from friends? A significant other? Family? The community? Your pets? Going back to our ubiquitous example, perhaps our querent will draw the courage needed to face his problem from his dog, whom he realizes loves him unconditionally. Perhaps we will realize that he will always have his family. Perhaps he will realize that there is more to life than love, and will do what he can without it. If the source of your Courage is abstract, then likely a Sword or Wand will appear here. If the source is more grounded, a Cup or Disk will likely appear here. If the source is grounded, then this position also will help you determine from what physical objects your Courage will come from. If Wands/Fire is present in this position, then your Courage in part comes from your indomitable will. If Cups/Water is, you draw it from your inner strength. If Swords/Air is, then it will come from your mindset, your rationale, and your principles of truth and reason. If Disks/Earth is, then it will come from those around you and your environment. Additionally, if a Six, Nine, Ten, or Ace is present in this position, then the source of Courage is especially strong and likely will not let you down. A Six indicates that your source is well-balanced and centered, a Nine that your Source is complete and full, a Ten that your Source is rooted firmly in the ground, and an Ace that your source is bottomless and overflows with energy. This position mirrors Position 2, but applies to Courage rather than Fear. If Position 6 explains where your courage is drawn from, this Position represents how it will manifest itself in terms of your ultimate reaction to the Fear. This card is linked closely to Position 4, as it helps you understand the best course of outcome for dealing with your fear. Position 4 gets you on the right track and offers one possible reaction, usually short-term, but Position 7 represents the longer-term process that will help you permanently deal with your Fear. If Positions 4 and 7 reinforce each other, than the Fear will be relatively simple to conquer; if they negate each other, then your Fear may be more difficult to conquer. Remember, however, that fear is always conquerable. It’s in your head. Sure, if an object is the source of the Fear, it can still harm you, but once you soar above bodily and hormonal reactions to it, the choice to Fear becomes yours alone. This card represents how the Courage will imbue you and allow you to face your Fear. If we return to our example for the penultimate time, our brave querent perhaps decides that no matter what happens, he will always have his dog to return to, and so is emboldened by this to let slide rejections; he knows that he matters to someone, and so if someone rejects him, he thinks that it’s ultimately their loss, not his. In this case, the Form Courage takes for him is self-esteem. If a Seven is in this position, be wary! Sevens in this position indicate a possible false sense of Courage, not truly drawn from your source, and might fail you in the end. This is not necessarily the case, but it is a distinct possibility, so be warned! Reversed cards in this position also mean that there might be a hurdle or blockage at first making it difficult for the Courage to manifest itself in your life. The is the summation card, and represents the changes that you will see in your life once the Fear has been conquered by your Courage. This is a broad card, and can mean anything, but it is essentially a summation of the previous seven cards and the lasting effect that they will have on you. Returning to our example for the last time, perhaps this card tells our querent that by overcoming his Fear using the Courage of his Self-Esteem, he will become a more confident person who will succeed in the world, and as a result of this grow to be loved by more and more people, until he dies as a beloved member of the community. If this card is a Nine or a Ten, pay special attention to it, as this process will make you stronger in the end. If this card is a Seven, the process may actually weaken you (what doesn’t kill you does sometimes make you weaker). If an Eight is occupying this position, it cautions you not to over-react to the conquest of your fear, and reminds you to remain balanced afterward. Position 1 – Four of Wands [Reversed]: The root cause of my Fear is an inability to be complete; the House of Leaves reminded me of the essential state of loneliness that we all experience in the world, that we can never escape from; it is impossible to completely “know” somebody. Everybody is, in the end, the unknown. Position 2 – Four of Swords [Reversed]: The form my Fear took was that of an inability to obtain restful sleep, or any kind of truce or break. Quite literally, the book made it impossible for me to sleep, and as its messages ring constantly in my mind, the Fear gnaws at my mind. I am surrounded by people, and their unknowable nature constantly reminds me of how alone I am and how alien the world is. I have no respite from these thoughts, and thus the Fear is with me always, and the Fear manifests itself as a constant presence and sense of restlessness and unease with everything. Position 3 – Ten of Pentacles: The effect that the Fear had on me was to render my material Wealth (from my family) meaningless, and illustrate how life means nothing without deep connections to others, no matter what you own. However, complete connections with others are impossible, and so the contradiction of the Tens emerge: I want that which I cannot have, and so am unsatisfied, and am affected by my fear by becoming unhappy, wanting more, and realizing that having everything is both futile and impossible. Position 4 – The Hermit: This Hermit advises me not to seek a period of withdrawal and contemplation in order to rationally sort out my fears and discover who I really am. While this could help – as we are all, ultimately, inherently alone – it would also hurt me by depriving me of the support of others. As this fear is about a lack of connection to others, cutting myself off from them could be disastrous, even though I know my bonds to others will never be pure and complete. Position 5 – Two of Vessels: This card advises me to seek out a companion to confide in and share my Fear with, thereby lessening the burden and reminding me that while on the ultimate level we are all inherently alone, on more superficial (in the literal, not connotative, sense of the word) levels, there are always others to support us. This is the course of action I ended up taking, and it worked. Position 6 – Six of Swords [Reversed]: My Courage will come from logic and reason. In the end, my confidante calmed me with exactly this; she sat me down and logically explained why I shouldn’t be afraid. Usually this doesn’t work with me, but combined with the calming effect of my confidante (and her humour), this did wonders. The card is reversed because the logic and rationale of Science was not enough on its own to banish the fears; the influence of the Two of Vessels was also needed. Position 7 – Nine of Cups: The Courage took the form of Happiness, as I realized that I would be okay even if I was on a fundamental level alone, because I would always have people who loved me, and that that was the best anyone could do. Therefore, I could unblock Completion (the Four of Wands) and be happy and content. Position 8 – The Fool: As a result of confronting and defeating my Fears, I will be ready to move on with my life, no longer worrying too much about being alone and alien to others. However, this card also reminds me of the cyclical nature of everything, and how another Fear will eventually take the place of the old one – but hopefully I will be ready and brave enough to face it. Hopefully this spread is helpful! This entry was posted on March 13, 2012 by Z. M. Wilmot. It was filed under Ponderings, Tarot . Thank you for this great spread. I’m wondering if you could help me to interpret one card that it seems like a mystery to me. I’ve been awakened for over 3 years now and I’m still having trouble when astral projecting. Yesterday I had a scary experience and I decided to do this spread. I can’t understand position 5, VI of Pentacles, as it is a superb card. I don’t know how to read it. I truly appreciate your help here. -The first is, depending on the deck you’re using, I might look more closely at the image. If you’re using the Rider-Waite deck, there are often little touches in the images that may not seem to explicitly relate to the card’s meaning, but can. For example, the six of Pentacles in the R-W deck has a wealthy man with scales in one hand who is also giving money to beggars, which could be viewed as redistribution, giving away, and/or rebalancing something. In this position, this interpretation could indicate that trying to spread/give away your fear to others (whatever that may mean) may end up hurting, or even that trying to “manage” the fear by rebalancing your inner self may not do you much good. Interestingly though, the 4 position in the Queen of Swords, who sometimes is associated with balancing, so perhaps this is not the path forward. However, combined with the Queen of Swords here, who is unafraid to do what must be done and focused on her goals. This could mean that true balance means finding a way to cut out the fear entirely… which might not be helpful advice. -The second is that maybe you actively need to avoid an “earthy” approach to conquering the fear. Interestingly, cards 2 and 3 are both Disks/Pentacles/Earth, meaning that there is a heavy earthy presence in the manifestation of the fear. Another pentacle in position 5 here could mean that you should avoid taking a grounded, materialistic approach to it; your solace instead will come from air (the opposite of earth, and what you had in the 4 position). Focusing too much on dealing with it materially might not be helpful. -The third is that this card can be associated with gain through hard work… it could be that you won’t conquer your fears through accumulation of resources or any sort of external help, and it is something that you have to deal with yourself. It could be indicating that trying to deal with the fear with external, material things will just make the problem worse, maybe by distracting you from the real problems; position 1 is a Sword (just like the card in the 4 position; so the root of the fear and your best path forward are both Swords/Air), while 2 and 3 are both Pentacles/Earth (just like your 5, the worst path forward), meaning that the problem is really about Air, but it manifests through Earth. It might be tempting to use resources and an Earthy approach because you interact with the problem primarily through Earth, but you need to cut to the root with Air instead. This card could again be telling you that it could be easy to superficially deal with the fear, but you need to not be distracted by seemingly “easy” solutions and handle the root of your fear, which sounds like something inside you. Your focus should be internal, not external.